For the last few days, Pakistan‘s capital has been on high alert due to the threat of a possible terrorist attack. Police and military vehicles have paraded around the city, commandos and snipers have been posted on Islamabad‘s picturesque Margalla Hills, and Pakistan’s Navy has been deployed to protect a city that is 915 miles away from the sea. But the mobilization is being portrayed by the country’s media as more of an inconvenience than a necessity. Almost 12 years after it joined the rest of the world in fighting terrorism, Pakistan still remains uncomfortable with the idea of confronting the terrorists. Pakistani politicians, clerics, and journalists see terrorism only as a consequence of their country’s alliance with the West, not as Pakistan’s problem to handle. The high alert in Islamabad follows the recent jailbreak in the country’s northwestern city of Dera Ismail Khan. On July 29, the Tehrik-e-Taliban Pakistan, an al-Qaeda ally, freed 253 prisoners, including 45 top terrorists, after storming a high-security prison. Besides five of the attackers, 24 people were killed, including 12 policemen, 4 prisoners, and 3 civilians. But the brazen attack remained the top story in the country’s media for barely a few hours. Squabbling among Pakistan’s politicians over electing a figurehead president garnered greater attention. Soon after, the antics of Pakistan’s Supreme Court, which accused populist cricketer-turned-politician Imran Khan of contempt of court, became the focus of the nation’s media attention. Interestingly, Khan’s political party rules the Khyber-Pahtunkhwa province where the jailbreak took place. After 9/11, Pakistan joined the ranks of nations united to fight the war against terror. But 12 years later, many Pakistanis remain unconvinced that terrorism must be fought as the greatest threat facing them. It’s odd that this confusion about national priorities persists as at least 5,152 Pakistani civilians have been killed in terrorist attacks by al-Qaeda and its associated groups since 2008, while the total number of Pakistanis killed by terrorism and the military’s effort to fight it since 2001 stands at 49,000. The Dera Ismail Khan jailbreak could have been averted if lessons had been learnt from an earlier attack almost a year ago on the Bannu Central jail in southern Khyber-Pahtunkhwa province. Around 400 prisoners were freed by over 200 heavily armed Taliban fighters during that assault. 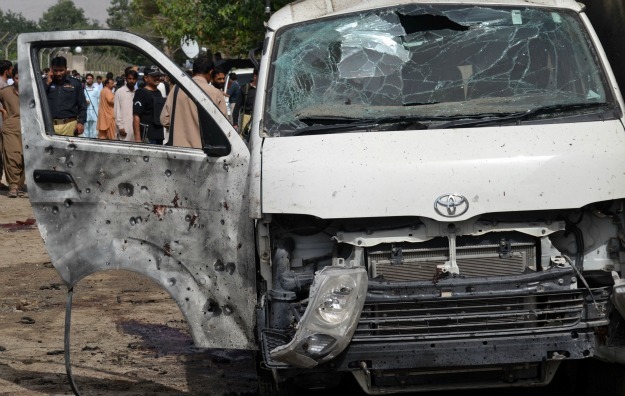 In Bannu, the Taliban attacked with 150 suicide bombers and took over the area for more than two hours. Their goal was to set some of their imprisoned comrades free. The Bannu Central jail was located on the outskirts of the city whereas the Dera Ismail Khan jail was centrally located in the heart of the city. The police headquarters, military cantonment, and the paramilitary Frontier Corps command center were not far from the prison’s location. The Taliban passed several checkpoints, roadblocks, and security personnel in the course of their offensive. Both on their way to the prison and on the way back, the Taliban’s massive convoy managed to go through without any resistance. Unluckily for the Shi’a prisoners in the jail, there was to be no release to freedom. Instead they were brutally murdered before the Taliban and the prisoners they freed drove off. The attack lasted six hours, reflecting the slow response of the authorities. No one scrambled fighter jets or sent up helicopters once the attack on the prison was known. The Taliban knew what they were doing and were prepared. The officials, on the other hand, were not. The Dera Ismail Khan jailbreak was one in a series of attacks on prisons, which Interpol suspects involve al-Qaeda. But so far, no Pakistani official has been held accountable for the incident and there has been no public discussion of the inside help the Taliban might have received. Among those freed from both the Bannu and Dera Ismail Khan prisons were several former military and law enforcement personnel who had sided with the Taliban or al-Qaeda in the past, but there seems to be little effort to figure out the extent of the terrorist groups’ penetration of Pakistan’s security services. Over the last year, several U.S. government officials and counter-terrorism experts declared that al-Qaeda had been greatly weakened and was no longer a major threat to the United States and its allies; however, recent intelligence about a major threat from the group has revived concern about its rejuvenation. The U.S. reaction to this threat was the immediate temporary closure of dozens of its diplomatic missions in the Middle East and North Africa. In Pakistan, the government’s response has been restricted to the show of force in Islamabad. The claims of victory against al-Qaeda were premature, and the U.S. embassy closures may be the starting point of re-thinking the group’s capacity for carrying out attacks. But in Pakistan’s case, there is still no willingness to recognize that fighting terrorism must be the country’s number one priority. Directly after the Dera Ismail Khan jailbreak and the Islamabad high alert, Prime Minister Nawaz Sharif left the country for Saudi Arabia for a non-obligatory religious pilgrimage. Seeing the government, and even the public, paying attention to everything but the terrorist threat, al-Qaeda and the TTP have stepped up their propaganda efforts alongside their attacks. Just this week, for example, the TTP publicly announced that it was holding hostage the kidnapped son of former Prime Minister Yusuf Raza Gilani, partly as a warning to his successor about the terrorist group’s reach. Instead of being motivated to mobilize public support for a coherent strategy, most Pakistani leaders are content to ignore the Jihadi menace. Once the current alert recedes, Pakistanis will most likely return to their television sets to watch game shows in which children are given away as prizes. Al-Qaeda and the Taliban, however, will be quietly planning their next big attacks. Farahnaz Ispahani is a public policy scholar at the Woodrow Wilson International Center for Scholars and a former parliamentarian for the Pakistan Peoples Party.